Amanda Hemingway also writes fantasy under the pseudonym Jan Siegel. She writes novels in other genres, also. She comments about her books at her website. CLICK HERE FOR MORE BOOKS BY AMANDA HEMINGWAY. Sangreal — (2004-2006) Young adult. A modernized retelling of the King Arthur legends. Publisher: A desperate mother spirits away her infant son, seemingly drawn (chased, perhaps?) to the small English village of Thornyhill. She ends up on the doorstep of old Bartlemy, a curious man who has lived on the forested land for as long as anyone can remember — and who comes to believe that the child is destined for great things… While growing up under Bartlemy’s protective eye, Nathan Ward senses something else watching him, a shift of shadows in the surrounding Darkwood. Then pieces of his dreams begin to come to life. A man he saved from the ocean washes ashore on the television news. A greenish stone cup set with jewels that has haunted his visions sounds eerily like one lost by the Thorn family centuries ago — a cup that has recently made its way back into the hands of the village’s last living ancestor. Yet when Nathan learns the chalice may have come from another world, a land with bloodstained moons and a toxic sun, he knows he is destined to play a part in something beyond his most vivid imagination. But why is the cup here, and what could it possibly want with a teenage boy and a sleepy town of villagers full of tall tales? With the help of his best friend, Hazel, Nathan must figure out why he’s been chosen — and for what purpose. Even if it means traveling deeper each night into dreams, into lands, into legends that both terrify and mesmerize him. 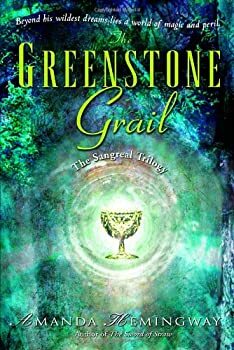 If one has to accept the fact that almost all fantasy books are now the beginning of a series (and we're just about to that point), then at least Amanda Hemingway's The Greenstone Grail is a compelling enough beginning to leave the reader wanting more while still resolving at least this portion of the story. Grail opens nicely with a bit of suspense and mystery as Annie Ward, carrying her infant son, is chased/herded, down a dark unfamiliar road by things dark and barely seen. She stumbles across a haven in the form of the small home of Bartleby Goodman, whose sight clearly has some power. From there we jump to when Nathan is thirteen years old and about to embark on the adventures of the trilogy.